Over time I realized how much it really did help my skin, for years I had dry flaky cracking hands that was once assumed to be eczema from my doctor — I found that the more I used ONLY Dr. Bronner’s and stopped tampering with the cheap antibacterial hand soap, my hands began to heal. I now know that what I have is dermatitis that is aggravated by harsh chemicals. Whenever I am visiting family or friends and am without Dr. Bronner’s to wash my hands, I find my hands go back to the way they were before… miserable and aged. Their bar and liquid soap saved my skin, and there’s nothing more amazing than that. Once addicted, I had to have more! I had been buying nothing but the peppermint bar until I came across their many other fantastic fragrances, as well as their soap in liquid form. Let me tell you… I’ve tried every single scent. Their unscented bar and liquid soap is perfect for those with extremely sensitive skin as well as for children. Their almond scent is to die for, to me it smells like cherries. The citrus scent is a perfect summer pick me up and makes a great kitchen hand soap. The rose scent is a tame floral, not too strong but just right for those who find themselves enjoying more feminine scents, while the lavender bar is true and very fragrant as if you just stepped into a lavender field. The tea tree bar is very masculine to me, it’s very musky and woodsy. However, I’ve found my favorites to be the peppermint, almond, and citrus. My boyfriend’s favorite is the almond and peppermint, although he seems to personally use the almond more. I buy the liquid soap in 32 ounces as I use it as a hand soap for the kitchen and bathrooms, as well as a body wash. I’ve found buying in bulk is best if you’ve found your favorite fragrance and use it as much as I do. The 32 ounce bottles cost me $16.99 at my local health food store and go a LONG way. I’d recommend buying a natural loofah if you intend to use it as a body wash as it’s a true liquid — it’s not thick like most body washes we know. That would be the only true complaint I hear from my boyfriend — but from me, I really have no complaints. The bar soap lathers amazingly well and I find myself using it a lot in the shower but saving it mostly for shaving my legs because it lathers so well and goes a long way when used for that purpose alone. Now, what’s really cool about this brand is that you can use their liquid soap for just about anything! I’ve used it to mop my floors, wash dishes, to clean up my cat’s dirty paws, as a shampoo, to clean messes up from the carpet, lift stains from the couch, and it’s even been used as a face wash (I hear the peppermint helps with acne!) It’s a truly neat product that goes a long way. I’ve recommended it to a few people now and those who have tried it have also gotten quite addicted! My mother being one of those people, she’s stocked up on nothing but the peppermint bar soap. – If you like peppermint, I’d highly recommend you try that one out first! 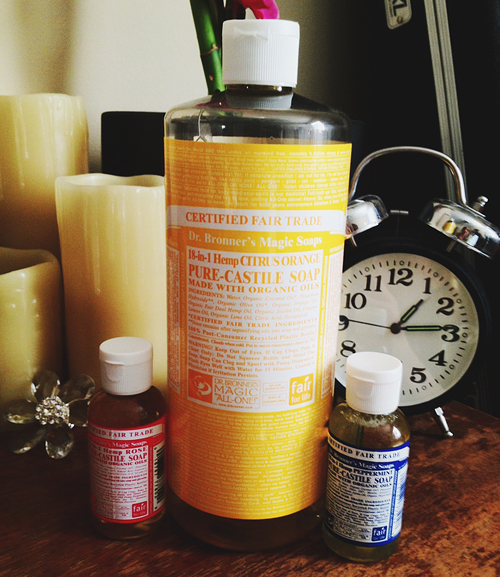 Dr. Bronner’s is an amazing company with many different products to offer. Their products are fair trade and USDA organic, so you can feel good about what you’re putting on your skin. Their products come in a wide variety of scents and items, many of them being unisex. I find that they’re perfect for those with sensitive skin and to me, the price is fair for what you get. A huge plus is that the liquid soap comes in many different sizes, you can buy in bulk and save money in the long run. Rating: Two thumbs up from me, four thumbs if you count my boyfriend too! ;D I would and HAVE recommended this to friends. Disclaimer: This review and my opinions are my own. I was not paid nor sponsored for this review. All products were purchased by me. If Santa were real, he probably would smell like Dr. Bronner’s peppermint soap.